Robert Monroe originally founded The Monroe Institute in order to study the strange Out of Body Experiences that he was having. This organisation later evolved its scope into a respected research organisation for studying and experimenting with human consciousness. 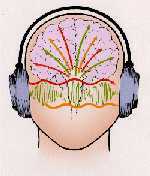 In the early years Bob Monroe started observing the affects of sound on different states of consciousness. He discovered that by using the natural phenomenon of binaural beats he could initiate the Out of Body state in other people. His technology, now known as Hemi-Sync is today used around the world for exploring unusual states of consciousness, simply using sound. This technology allows anyone to experience profound states of consciousness, that up until this point have only been available to the very few. The Monroe Institute is available to almost anyone interested in exploring the non-physical realms and unusual states of consciousness. They teach programs using their sound technology that enable the participant to explore the Afterlife and get verification of the reality of those experiences. Solely using the power of sound, a person without any previous psychic skills can have an experience that can prove to them that they will survive bodily death. You can buy “The Gateway Experience” home training course from the Monroe Institute by clicking here. A person may die in their asleep and on regaining consciousness in the after life, may not realise that they're dead. They may be rather confused when they realise that friends and loved one's, who they can see very clearly, are completely ignoring them and walking right past them. Sometimes people become stuck if they have died very suddenly and don't realise they have died, or if they have died in a very traumatic way. A person who believes utterly that after death there is nothing but complete blackness, emptiness and annihilation may often experience what appears like a deep sleep or dreamless state. A person who has died and becomes stuck often has their point of focus turned towards physical reality and earthly life. It is therefore often easier for a physically alive person to make contact with them, and move them on to the place that most suits them, than it is for a being from a non-physical realm to make contact with them. A person that has become stuck after death may often see people in the physical world going about their daily business. However, it can be very difficult for non-physical helpers to make contact with these people who have become stuck after death. The person who is stuck may actually perceive these helpers or non-physical entities as ghosts. In the Monroe Institute's Lifeline Program a person can learn how to make contact with someone who has become stuck. They can then introduce this person to a non-physical helper who can then assist the person to move on to their true destination.